Remember that perfect beach house from your childhood? 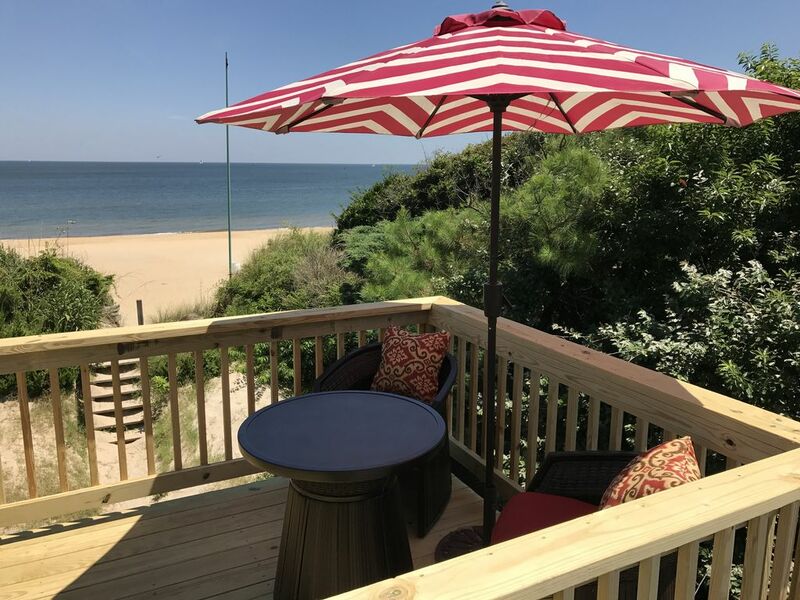 Re-live that perfection at Dolphin Daze Beach Cottage, a retro chic cottage located on the Chesapeake Bay. The cottage has been modernized but retains the character and charm of a 1940's beach cottage. There are 6 Bedrooms, 4 Bathrooms (two with bathtubs) 4 outdoor decks with amazing views, 2 kitchens with everything you need to cook and entertain, and tons of room to ramble around. The cottage is approximately 3500 square feet with 6 queen beds and 2 futons. The backyard and the dunes intermingle with direct access to the beach. There is an outdoor fireplace, gas grill and other accessories to use while you're hanging out on the sand. Dolphin Daze has private, off street parking for up to 6 vehicles, lots of outdoor seating and a washer/dryer. See you on the beach soon! Dolphin Daze layout consists of a ground level entrance with a garage and laundry area. Up a flight of stairs from street level is the Main Floor which has a full kitchen, three dining areas, living room, TV room, game room two bedrooms and a bathroom. There is also a converted porch that doubles as a fourth dining area. The Second Floor is up a flight of stairs from the Main Floor. There are three bedrooms and two bathrooms on the Second Floor as well as three outdoor decks - The Morning Deck, Afternoon Deck, and All Day Dolphin Viewing Deck. One of the bedrooms on this floor has a lounge with a double futon and attached bathroom. The Third Floor Suite is up one flight of stairs from the Second Floor. There is a bedroom, kitchen, living room and bathroom on the Third Floor. There is also an outdoor deck with great views of the bay. All the bedrooms at Dolphin Daze are oversized and have new queen size mattresses. All linens are included. I'm a local real estate professional (and Professional Ballroom Dancer) that manages Dolphin Daze for the owner. I've been in the property management field for many years and look forward to providing you with the best vacation experience possible. Please feel free to let me know of anything I can do to make your stay better. This is a unique property, one of the few left on the beach that has that has been modernized but still retains that 1940's charm that you remember from the past. Tons of space to let your hair down, in fact it's easy to loose someone in the cottage! The Beach is the backyard. toilet, tub, shower, Shared by two bedrooms on the second floor. toilet, shower, On the Second Floor. Dolphin Daze is on the beach. The cottage sits in the dunes of the Chesapeake Bay. There are views of the water from most rooms and from all the outdoor decks. The main floor has central air and heat. The second and third floors are window units. Each bedroom has a window unit. There is private, off street parking for up to 6 vehicles. There is an outside wood burning stove with wood provided. Kuerig with plenty of coffee free of charge. Cream, sugar and other items are also provided. There are basic pantry items but if you need anything specific you can message Brent or go the the Grocery Store less than five minutes away. There is a convenience store less than a 5 minute walk. Everything you need to cook and entertain. There are four separate dining tables. There are many stairs and is not suitable for wheelchairs. The house is full of charm and character and was perfect for our group of 6 couples. We were in town for a concert at the Hampton Coliseum. The house is spacious and provided plenty of room for everyone to spread out. Brent was very responsive to all of our inquiries. Property was fantastic--right on the beach and plenty of space. Brent was incredibly responsive and was able to accommodate all of our requests re: check-in and check-out times (even last minute). Definitely would recommend to a large group. Lovely stay. Beautiful home, on an almost private stretch of beach. My extended family enjoyed a great visit to Dolphin Daze in late July. The house comfortably slept 10 people even without using the self-contained apartment on the top floor. Some particular features that we enjoyed that we haven't always experienced in summer rentals: completely quiet (we never had noise issues from either traffic or other people), parking was a breeze with plenty of space off the street for multiple cars, climate control worked great, and we had everything we needed for a beach getaway. Brent was incredibly responsive both before arrival and during the stay. The couple of times we had a question he got back to us in minutes. The greatest feature, and the most important to us, was the beach itself. I wasn't familiar with Oceanview before this trip and we were all thrilled by how great it was: very family friendly with clean sand, only small waves (one morning it was more like a lake than the ocean), all just steps from the house. Other features we appreciated were the the well-stocked Keurig coffee machine, washer and dryer (coin op but with the coins provided, so free to use), the gas grill, the outdoor fireplace (which we used to make smores), and the kayak.